Usually I save these posts for hf, but since I've started it here, I'll finish it. 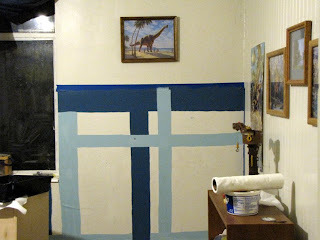 When I first started with the dark blue paint, I wasn't sure if it was going to turn out how I wanted. It was pretty bold and shocking. 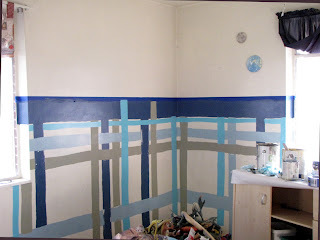 Then I added the light blue, and I started to feel more comfortable. When the sage was added, I started nodding. Then the light turquoise (the color of the ocean on many maps and globes), really brought it together for me. 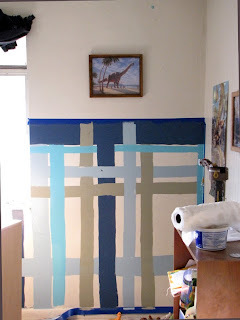 Next I'm off to add the last color - a soft, buttery yellow, then I'll put a strip of sage across the bottom. 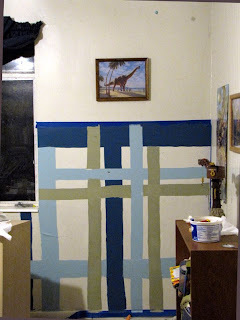 Tomorrow I'll tape off the sage, and paint the bottom molding white. It's not finished yet, but I love it. Most of the paints we already had, I just grouped them together. I love the earthiness of the colors, and the raggediness of the lines. I'll be tidying them up a bit, of course, but for the most part this is how it will look. One thing that surprised me was that I love is the way the gloss of the satins (the dark blue and the turquoise I bought yesterday) contrast with the flat finish of the sage. It gives it a textured, natural, woven feel. It kind of brings the feel of it all together. It looks like it will turn out quite well. I like it! oh it looks lovely!! Nice job!!! I LOVE it! I LOVE those colors together too.